Compared to controlling and programming the GPIOs via "sysfs", "pigpio" on the command line is a simplification. The command line tool "pigs" also supports the programming of a GPIO as PWM and servo. 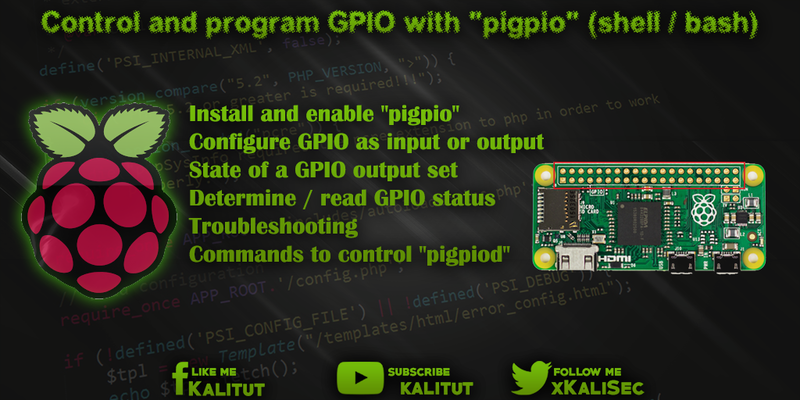 "pigpio" is also the preferred method for controlling and programming the GPIOs on the command line. If not already installed, the installation of "pigpio" is done with the following command. The control of the GPIOs is done with the command line tool "pigs". For this to work, you must first start the pigpio daemon. If you want the daemon to start automatically at system startup, then execute the following command. Then you can configure the individual GPIOs. Here we select the GPIO 17 (pin 11) and GPIO 18 (pin 12) as examples to configure them as output and input. For this the BCM numbering of the chip is used. So the number of the GPIO and not the pin. If the GPIO 17 is to be configured as output, the following command applies. By default, the output gets the state "low" or "0". If the GPIO 18 is to be configured as an input, the following command applies. Basically you can only set outputs. To set the state of a GPIO output to "high", the following command is sufficient. To set the state of a GPIO output to "low" the following command is sufficient. To determine the state, ie "high" or "low", at a GPIO, the following command is sufficient. The GPIO can be both an input and an output. The output "1" stands for "high" or "0" for "low". When executing the pigs commands, the error message "socket connect failed" appears. This does not mean that the pigpiod daemon is not running. You have to start it yet.